Composed by Richard Fox. Blues. 9 pages. Published by Severn Music (S0.124009). Two String Blues is part of the Ensemble Performance Series from Severn Music. 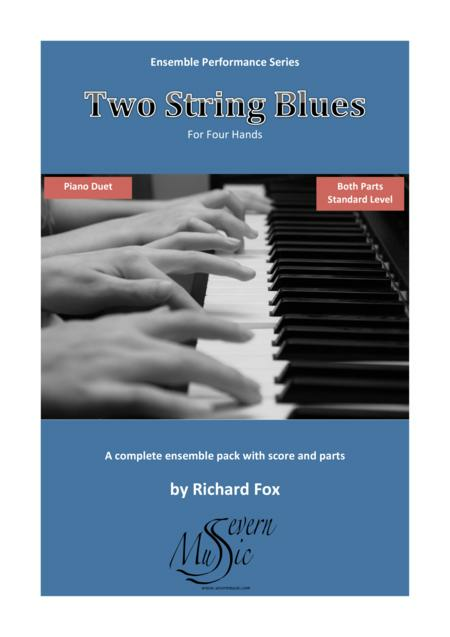 Each title in the series comes in packs for different groups of instruments, wind, piano, guitar, and strings, which are in the same key and can be combined to create flexible ensembles. These pack are ideal for teachers or conductors who are planning concerts, recitals or preparing students for GCSE and A Level Music exams in the UK. All of the pieces exceed a performance time of 2 minutes. This piece is availble in the following versions, which can be combined as required:• Piano Duet (Primo and Secondo) • Guitars (2 Guitars, Bass, chords and piano)• Wind (C, Bb and Eb instruments plus piano, bass and chords)for more pieces from this series visit: www.severnmusic.com.